Running your WGC Bracket Pool has never been easier! Now you can run a bracket pool for those golf nuts in your family or office. If they enjoy March Madness, they'll love our WGC Bracket Pool format. There's no better way to kick off the 2019 PGA season than by running your own golf bracket pool for the WGC Match Play Championship. 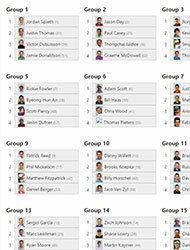 Pool members rank the finishing position of all 64 golfers in their respective groups. In just a few minutes, you'll have your golf bracket pool ready for your members. Supply us with your contact information, a pool password, and your customized pool settings. We provide you with pre-formatted e-mail text that you can simply forward to the people that you'd like to join your pool. It contains a link and all the information they need to join. Your pool members are provided with a bulletproof bracket submission form. No more incomplete or illegible brackets, and absolutely NO work for you, as the Pool administrator, to do. Step 4 - Enjoy the Championship! We take over from there. Your pool standings and all other reports are updated in near real-time as each golf match concludes. We collect your members picks. Members login to the website directly to make their picks. Pick sheets can't be filled out incorrectly for illegibly. Our pick sheet is simple and error-proof. 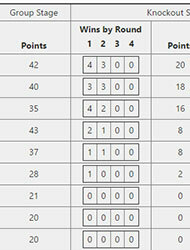 Pool standings are automatically updated in real-time. No delay in tabulating standing ... and there's no work for you! Members simply login to the site to see updates. Every pool hosted at RunYourPool.com includes a free, private message board. Your pool's message board, accessible only to your pool members, is a great way to communicate throughout the Tournament. The price to continue using the service is based on the number of bracket entries in your pool. The following price tier structure is your one-time fee for the entire WGC Match Play Championship! 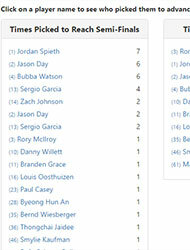 (NOTE: An "entry" is considered a member's submission of one complete set of Group Stage picks along with one set of bracket picks, containing all 16 golfers than make it to the Knockout Stage). Golf Bracket pools are great promotional opportunities for your business. Whether targeting prospective clients, retaining existing clients, or just running an office pool, we now offer a way for you to enforce your company brand. It's ABSOLUTELY FREE to add your company or organization logo to customize the look of your WGC-Accenture Match Play Bracket pool. For more information, see our Brand Your Pool page. 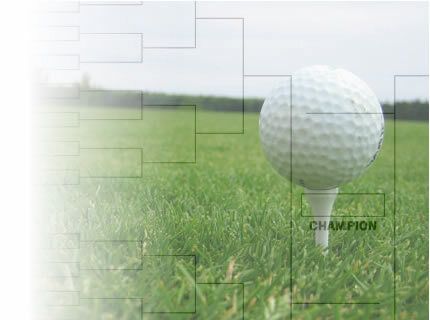 Start your WGC Golf Bracket WGC Match Play Golf Bracket pool with us today. If you have any additional questions, please contact us via e-mail. We're happy to answer any questions you may have.